Accounting statements in accordance with the actual business are more and more becoming complex and bloated fixtures of financial institutions. 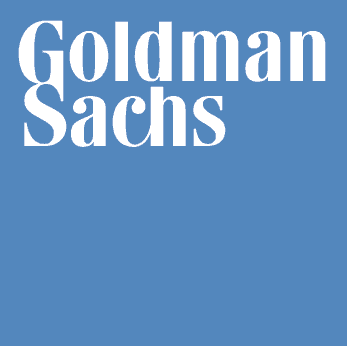 At the end of third quarter 2008 Goldman Sachs listed six recent accounting developments on its consolidated financial statement 10-Q. This changed dramatically for the most recent quarter and Goldman’s 17 accounting changes opened a new frontier for wild west style accounting. Though these days reading a financial statement and understanding it is almost impossible, tenacity can pay off and hopefully reveal some insight into the health of Wall Street’s former behemoths. Under cash flow from operating activities there is a fixture called trading assets at fair value. There is nothing peculiar about this other than the fact that its value jumped beginning with the fourth quarter of 2008. Inquisitive minds might remember that a significant accounting change took place during this quarter. The Financial Accounting Standards Board (FASB) introduced FAS 157-3 in October 2008. Staff Position 157-3 acknowledged the use of management estimates or assumptions in “Determining the Fair Value of a Financial Asset When the Market for That Asset Is Not Active”. In April 2009 this accounting rule was amended to FAS 157-4 to accept this kind of fair value estimates also to not orderly transactions with significantly decreased trading activity. Goldman’s worst quarter ever was the third quarter ending August 29, 2008. This was the quarter before the accounting changes were implemented. During nine months ending August 2008 (GS fiscal year used to start in December before the firm changed its status to a bank holding company), cash flow item trading assets at fair value registered a meager inflow of $37.9 billion. A year earlier the company had even outflows of $92.7 billion on the same position. From January to June 2009, in the first two quarters of the new bank holding company, inflows into this category of cash flow from operating activities had already taken off at $172.39 billion. A year earlier in the six months to May 2008 inflows came in at only $28.8 billion. The firm of course does not further specify trading assets at fair value and which assets create its cash flow. Since assets are designated fair value therefore not easily convertible to cash it is reasonable to assume that cash flow generated is associated with non-current assets. Associated cash flows are added back or subtracted from the income statement depending on inflows or outflows respectively. In that sense $172.39 billion of fair value inflows might have substantially contributed to positive earnings during the first two quarters of 2009. I think is is fair to say that accounting change FAS 157-3 threw a lifeline to even our most venerable institutions on Wall Street. In the Huffington Post Nathan Lewis asked the question: Do We Need Goldman Sachs? Without FAS 157-3 this question would be redundant. Most likely GS would have already drowned in the stormy sea of mortgage backed securities and credit derivatives. Could it be that recent celebrations on Wall Street are nothing but a smoke screen blowing hot air into the face of investors? In its August monthly report a congressional oversight panel (COP) evaluating troubled assets on the books of large and smaller BHCs came to the conclusion that a substantial portion of toxic assets from mortgage backed securities and real estate whole loans still remains on bank balance sheets. Goldman Sachs and Bank of America are two examples of masterful deceit sanctioned by the appropriate agencies. I am beginning to think that former New York AG Spitzer is right and democratization of capital markets is no more. Last Sunday Ben Bernanke, chairman of the Federal Reserve responded to questions from the public in a town-hall style meeting. For the first time in history an acting Federal Reserve chair stepped into the arena that is usually the prerogative of obligations among elected officials. We truly live in interesting times. What could have provoked this extraordinary move by the chairman given the daunting unpopularity of cumulative actions taken by the Fed in the last twenty four months? The answer is already given in the question. Ben Bernanke is shopping for popularity in order to better his approval ratings. His term as chairman ends in January 31, 2010, when he is up for reappointment by president Obama. I can only imagine it must have been scary and embarrassing for the chief to step in front of the very same audience he led down over the course of the last ten years. He certainly did not mean to inflict any harm upon his fellow countrymen, but together with his predecessor Greenspan he helped lay the foundations of a shaky economy based on bubble economics. Sure he gave birth to many millionaires and even some billionaires, but for most people Greenspan’s and Bernanke’s policies were rather harmful. Certainly one cannot expect any sensational outcome of such meetings with both a preselected audience and preselected questions. Organizers won’t let that happen though the chairman won’t suffer any lasting damages. It would have been nice though to read Bernanke’s mind. To his defense the chairman admitted that he was disgusted from bailing out giant Wall Street firms like AIG, Bear Stearns or Merrill Lynch and rescuing them from going bankrupt. Though we certainly respect his wish not to reside over a second Great Depression, of course we have to believe him that there were no other options at the time. I might also add we are not yet with absolute certainty out of the woods with regard to another Great one. Asked about his too-big-to-fail policy he seemed to indicate sympathy for the public’s frustration and promised to make it better in the future. Though his credibility was called into question by reiterating his opposition to an independent outside audit of the Fed. Why no audit if he has nothing to hide? Yes there is the issue of independence of the Fed, but just how much independence was there say in the last ten years?! The Federal bank closest to Wall Street, and therefore in a special position with regard to the nation’s largest financial institutions, is the Federal Reserve Bank of New York. During the financial crisis Federal Reserve and Treasury Department officials made all major decisions, but the New York Fed executed them. In the meantime the New York Fed has been criticized as too close to Wall Street. William Poole, a former Fed president, missed a longer-run perspective among the Fed’s staff. They adopted a trader mentality instead and did not pay enough attention to a system skewed towards too much risk taking by numerous bailouts of large Wall Street firms. The Fed’s board of directors is composed of powerful bankers and corporate titans like Jamie Dimon, the head of JPMorgan Chase, and Jeffrey Immelt, General Electric’s chief. Richard Fuld had to resign after Lehman’s bankruptcy and Stephen Friedman called it quits over a conflict of interest with the other board he served, of investment power house Goldman Sachs. The corporate-federal officials network seems too tight to ever disintegrate. It is not only the Federal Reserve that has to fear for its independence. The lobbying departments of large financial institutions have expelled their tentacles even into the Financial accounting Standards Board (FASB) of the United States and the International Accounting Standards Board (IASB) of Europe. According to a recent report by an international team of former regulators and corporate officials, the Financial crisis Advisory Group deplored efforts by politicians to prescribe changes on accounting standards. The integrity of valued assets on the books of financial institutions should not be called into question in an effort to save those institutions from potentially harmful bets gone awry. In April, 2009, FASB already caved in to heavy financial lobbying and paused fair-value accounting rules for illiquid assets. Beside all the regulatory and statutory powers bestowed on elected or appointed officials their most potent tool still remains the integrity of the person and organization in question. It is by no means sufficient for Fed chair Bernanke to communicate his objection to the bailouts on Wall Street even if it is within such an elaborate setting of a town-hall meeting. There is not enough meet on the bone to undo what has already happened. A Gallop poll, conducted in mid-July, found that only 30% rated the Fed as doing an excellent/good job. The bank had the lowest score out of nine government agencies and it was down sharply from the 53% who still approved of the Fed’s job in 2003. This time even the CIA and the Internal Revenue Service scored better than the Fed. Bernanke will have to do better. It will most certainly be like walking a tightrope. Is CRE the next accident to happen? Commercial real estate is shaping up to become another causality of the financial crisis and CRE mortgage delinquencies and loan defaults are now starting to pile up on the balance sheets of US financial institutions. That is of course on top of losses from residential real estate, consumer credit and the securitization markets that sort of connect all the sore spots on Wall Street. 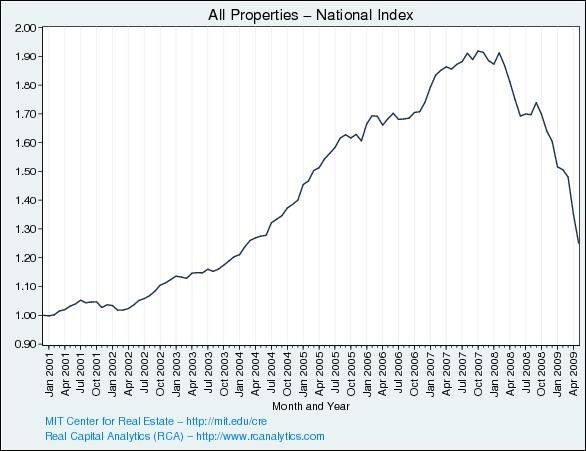 $817 billion of total CRE-loans are still outstanding in June, 2009, and about 29 billion have run into trouble. In the month of June loan delinquencies soared by $10 billion heating up the debate about future CRE losses by financial institutions. But that’s not all. About $105 billion worth of troubled loans have been worked out. A majority of those loans experienced an averaged loss of almost 64 percent. Delinquency rates on CRE are up to 4.5 percent in the second quarter from 3.6 percent in the first quarter, 2009. In CRE much like with residential real estate many loans have been securitized and actual losses to financial institutions and investors will therefore depend largely on two conditions. First, the total amount of loan defaults will be substantial given the collapse in prices. Second, FASB statements 166 and 167 will determine how big the losses are or if they can be deferred onto some future time horizon. FASB statements 166 and 167 refer to securitized loans in special purpose entities, and require banks to consolidate insufficiently capitalized SPEs onto their balance sheets. Although this should foster more disclosure for investors its impaired with whims of possible rule-bending. FASB determination to implement these rules is another uncertainty factor. In April, 2009 FASB halted fair value accounting to stop the hemorrhaging of impaired financial assets. Statements 166 and 167 are supposed to take effect in the first fiscal quarter beginning after November 15, 2009. Some are already preparing for the worst. Bank of America now expects to bring about $150 billion back onto its balance sheet under the new FASB rules. This 150 billion off-balance-sheet assets comprise of $12 billion home equity conduits, $85 billion card securitizations, and other variable interest entities make up the remaining $53 billion. Maybe BofA is just lucky. Meredith Whitney, the star analyst on Wall Street who correctly predicted the massive asset problems faced by all major investment firms during the last several quarters, increased her price target on Goldman Sachs. It prompted some to speculate if she had eventually flipped on her bearish posture on financial institutions in general. I don’t know if she did but the results of Goldman’s second quarter, blowing past all expectations certainly didn’t make her job any easier. In the latest April to July quarter Goldman’s profit leaped 65 percent compared to the same period of last year. It certainly makes one wonder what does Goldman have that others don’t. For one thing a Tier 1 ratio that is depending on how you look at it, whether its Basel I of II, at 13.8 or 16.1 percent respectively. In addition the amount of liquid assets averaged $171 billion during the quarter. That is certainly a nice capital cushion in case of a more adverse operating environment in the future. The most staggering part of Goldman’s earnings release were the huge revenue gains of 93 percent to 10.8 billion within its equities and principal investment unit. Trading and risk taking really paid off and the firm greatly profited from much higher than usual volatility in the markets. These ups and down in the market prompted Matt Taibbi, a business writer for the Rolling Stone magazine, to call Goldman the Great American Bubble Machine. Maybe after this earnings bonanza it becomes more clear why Taibbi felt compelled to make such an outrageous claim. Goldman promptly dismissed it as the usual conspiracy theory. Taibbi’s accusation certainly helps to explain some of the investment firm’s wizardry, and his uncompromising look behind the firms machinations reveal a really sinister network of public and private interconnections (see also here). On a more straightforward note the mere fact that Uncle Sam changed financial accounting rules back in April might have laid the foundations for the biggest jump in quarterly earnings since its IPO. In April the Financial Accounting Standard Board (FASB) succumbed to financial industry lobbying and lowered its requirements for market-to-market accounting of low liquidity investments without a real market. This move saved US financial institutions tens of billions of dollars in write downs to their balance sheets, which threatened to become an endless open pit. At that point FASB only leveled the playing field for US financial institutions with their European counterparts, which according to IASB existing rules were not required to strict market-to-market in the first place. These days though IASB has again put the screws on financial institutions by threatening to implement new pro-cyclical rules in market-to-market accounting. Getting back to Goldman, there is no denying the fact that the firm has a strong desire for excessive risk taking but they obviously seem to be able to maximize shareholder value even in a time more adverse to such high flying objectives. Again, what does Goldman have that others don’t? Maybe it has to do with a high stake in another firm. Together with JPMorgan, Bank of America and Royal Bank of Scotland, Goldman is a major shareholder of Markit, a firm which supplies information to financial markets around the world concerning the pricing of credit derivatives. 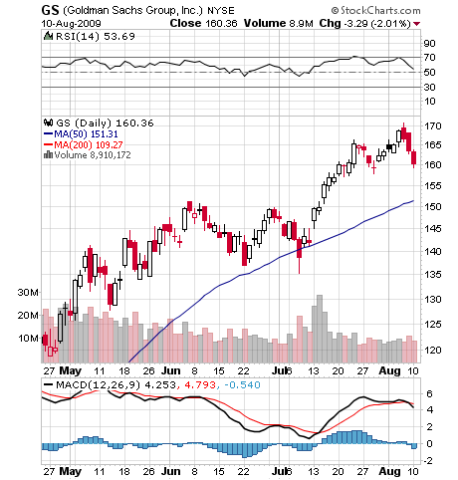 Many believe that these relatively new products are at the core of the financial meltdown. The US Department of Justice is now requesting detailed information about the pricing of credit derivatives and has launched an investigation into the ways Markit supplies this information and whether the firms owners have unfair access to vital market-making data. Markit of course denies any wrong doing, and so is Goldman I am sure, but hopefully the investigation will not stop here or just end in talk. Das Sentiment über die Wirtschaftslage (ZEW-survey) hat sich unter den 294 befragten Analysten und Finanzmarktexperten im Monat Mai wieder deutlich aufgehellt. Insbesondere haben sich bei den Experten die Erwartungen, das sich die Wirtschaft in den nächsten 6 Monaten erholen wird, gestärkt. Für die Eurozone sehen um 17 Prozent mehr als im Vormonat eine Verbesserung, für die USA sind es um 13 Prozent mehr Analysten die ein Verbesserung erwarten. Die gegenwärtige wirtschaftliche Lage wird von durchwegs über 90 Prozent der Befragten als schlecht eingeschätzt. Interessant ist das bei der Beurteilung der unterschiedlichen Wirtschaftsbereiche nur im angeschlagenen Finanzsektor eine Verbesserung registriert wird. Wobei bei allen Sektoren, wieder mit Ausnahme der Banken und Versicherungen, auf monatssicht gesehen mehr Analysten eine schlechtere Bewertung abgegeben haben. Obwohl die Märkte positive auf die Veröffentlichung reagiert haben sind die Ergebnisse alles andere als gut. Das unter der Finanzbranche Optimismus aufkeimt ist zu einem Teil Berufskrankheit. Kapitalmärkte ohne Zweckoptimismus gibt es ganz einfach nicht. Eine tatsächliche Erholung in der Branche ist aber auch nicht weiter verwunderlich, nach den vielen hunderten Milliarden die in die Finanzmärkte gepumpt worden sind und weiter werden. Für Amerikanische Banken hat sich besonders im März dieses Jahres das Blatt gewendet, als das Financial Standard Accounting Board (FASB) kurzerhand die sogenannte “significant judgement rule” eingeführt hat. Diese Regeländerung erlaubt den Banken genau das, nämlich bei der Bewertung finanzieller assets eigene Richtlinien zu verwenden. Wer einmal lügt dem glaubt man nicht und den Banken schon gar nicht, die sich sicherlich mit dieser Regeländerung nicht in den eigenen Fuß ihrer Bilanzen schießen werden. Aber dass man auch und gerade die Europäischen Banken mit Samthandschuhe anfasst, ist spätestens seit Ende letzter Woche Gewissheit. Die EU hat unter der Federführung der ECOFIN, Council for Economic and Financial Affairs, um dem Beispiel der Federal Reserve zu folgen, Stresstests für die heimischen Banken angekündigt. Auf Druck nationaler Interessen hat die ECOFIN aber beschlossen die Ergebnisse eines solchen Tests geheim zu halten. Ein Umstand der im krisengeschüttelten Amerika, zumindest nicht in der Öffentlichkeit, nicht einmal andiskutiert geschweige denn umgesetzt wurde. Unter diesen Umständen ist es nicht weiter verwunderlich dass Optimismus aufkeimt und Kapitalmärkte wieder nach oben gehen. Vielleicht liegt in diesem Zweckoptimismus aber auch ein Funke Hoffnung, das sich die Wirtschaft tatsächlich den ZEW Erwartungen anschließt. Dann kann das Wunder des einundzwanzigsten Jahrhunderts vielleicht doch noch Realität werden, und obwohl sich die Geschichte nicht wiederholt kann sie sich sehr wohl reimen. JP Morgan lässt Grüßen.